Ladies and gentlemen, these are the words of Paddy Bevin. What do you want to know about the man? He’s 27 years old, a Kiwi, a triplet and a bloody good bike rider. Paddy hasn’t followed a conventional path in the world of cycling, his route has seen him race in three different continents. This began as soon as he left high school, the fresh-faced youngster headed to the USA and began his cycling career with Bissell Pro Cycling. After four years in America, Bevin struggled to break into the World Tour. He returned “home” and joined Avanti in 2015, it seemed a classic case of one step back, two steps forward. 2015 was a landmark year for Bevin. As Pat mentions, he was on a different level to the other riders around at the time. Avanti were in dominant form in the National Road Series, with Bevin scooping up many wins. The finest was in the Herald Sun Tour, where he won the Queen stage on Arthurs Seat. The big difference in this race was that Bevin was up against the power of Orica Greenedge and he managed to outgun both Cameron Meyer and Simon Clarke to take the win. “I just had a great year. I had done a few laps around the cycling world (time in the USA and then a brief stint on the track) and had just gone back to basics on the road. The team’s structure and ideas suited me really well and I just thrived. It wasn’t really huge pressure, it’s spread around almost the whole team that started each race, then the guy with the best legs finished the job. After such a strong year, it was inevitable that Paddy would eventually get his crack at the big time. He signed a two-year contract with Cannondale, packed his bags and got ready to prove himself against the best in the world. The highs started immediately, with 10th place in the TDU and a podium spot in the opening prologue in Paris-Nice. It was this result that took a few people by surprise and they were quickly asking who the Kiwi was. After such a strong start in 2016, the rest of the season failed to reach the heights that Bevin set for himself. As he already mentioned, being a little bit older worked out well for him, he was able to maintain his motivation throughout this difficult period. 2017 featured some good results, in particular, his performance in the Tour de Suisse. After netting 2nd, 6th and 4th in the sprints, he finished 10th in the final ITT, an impressive result in such a demanding stage race. Then came the news that BMC were interested in signing him, it must have been a huge boost to know that one of the best teams wanted him. 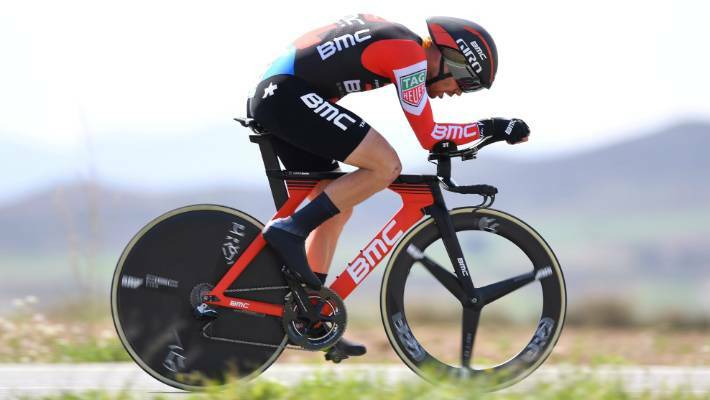 Changing from the Cannondale TT bike to a BMC one must have made Paddy feel like a kid on Christmas Eve! He was joining a team who prided themselves in their TT performances and this is where we started to see some rapid development: 8th in Abu Dhabi, 14th in Tirreno, 2nd in Pais Vasco, 2nd in California and 8th in the Worlds. On top of that he was in the TTT squad who won in Tirreno and the Tour de France. It was a stellar season against the clock. “This season has been the first I have been able to give any real focus to it and the improvements have stemmed from there. I feel like there is still a huge chunk of time to be saved and it’s an ongoing project. Biggest improvement is just the basics: getting a fit done on the track and then training on the bike week to week. I have never been into the wind tunnel and only really had a couple of sessions on the velodrome. Everything else has been self-worked. It’s a catch 22; teams generally don’t put the resources into the TT stuff until you are producing results and these days you need a more than proficient position just to get into the top 10! Not many riders like a TTT, but Paddy’s not the first Kiwi I know who likes this discipline, Greg Henderson was also a big fan. To do well in the TTs takes a fair amount of work. Riders who are serious about this discipline need to spend a chunk of training time focused on it. 2018 was a brilliant year for Paddy. I’ve already detailed his TT success, but he also wore the leader’s jersey in both Tirreno and the Tour of Britain, where he managed to finish 4th on GC. A lot of the time he was a willing domestique for their incredibly talented squad, but he certainly took the opportunities that arose, which included his first crack at the World Championship TT title. Looking ahead to 2019, some big changes are on the horizon. The end of the BMC team potentially left Paddy without a team, but his impressive performances led to him being too important for them to throw away. Paddy joined a number of his former teammates, and boss, in their new project, CCC Team. It will be interesting to see how Paddy copes with the change of team and also a change of bike. Moving to a team with less team leaders should see more leadership opportunities for the developing Kiwi. 2018 gave an insight into what he is capable of producing in stage races, something I would like to see more of in 2019. Paddy is one of those annoying riders (for his rivals) who can climb well, but also sprint fast at the end of the race. He was affectionately nicknamed Splimer back in his Avanti days! When you consider his TT ability, he stands a great chance in challenging in a number of stage races. I agree and think that he could be a very important part of Greg Van Avermaet’s support network in Belgium. Yes, it might take a few races for him to find his feet, but Paddy certainly has the ability to succeed in the classics. After enjoying his time doing the Tour of Yorkshire and Tour of Britain, I wondered about the 2019 World Championships, which just happen to take place in Yorkshire. Just remember, you read it here first! Away from the cycling, what about cooking, my other love! “During the season I cook almost every day at home; beef Stroganoff is my signature dish. Which neither sounds, nor looks that appealing, but you don’t know it till you’ve tried it,” sounds like an invite if you ask me! As a fan of power meters, I couldn’t help but get Paddy’s view on the current hot topic of banning them in the Tour de France. 2019 promises to be a big year in the life of Paddy Bevin. His progression, particularly on his TT bike, has seriously impressed me over the last couple of seasons. With a continued focus on learning and improving, I’m excited to see what he can achieve riding for his new team. I hope this interview has given a little insight into his approach to cycling and it will come as no surprise to you how Paddy describes himself… “pragmatic”. If you liked this interview, head over and listen to my podcast series.